Historical Marker #2410 in Stanford notes the role that Cherokee Indians played in the settlement of Kentucky, and thus the westward expansion of the United States. Cherokee Indians are believed to have lived and hunted in what became Kentucky for hundreds of years before the first known white explorers made their way through the mountain passes. The Cherokee primarily settled in the southern Appalachian Mountain region and developed a subsistence culture that was matrilineal in structure. While Cherokee men hunted, gathered, and warred, women tended agricultural crops. Families followed the households of mothers. As Euro-American hunters and explorers moved westward through the mountains from Virginia, North and South Carolina, and Georgia, conflicts developed between the frontiersmen and Indians. In the 1770s, as the number of white settlers continued to increase, some Cherokees sought to make concessions with the pioneers. In 1775, Cherokee delegates met with representatives from the Transylvania Land Company at Sycamore Shoals, on the Holston River in what would become East Tennessee. At Sycamore Shoals, the Cherokees signed a treaty that relinquished lands west of the Kentucky River to the land company. This agreement opened the way for settlers like Richard Henderson, Daniel Boone, James Harrod, and Benjamin Logan to establish pioneer communities in what would become Kentucky. Some Cherokees were not pleased with the Transylvania treaty. 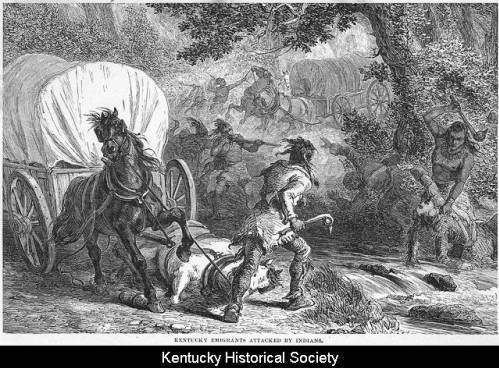 Those who believed that the presence of Euro-American settlers would end their way of life, raided frontier settlements and attacked groups along Boone Trace and other early routes of travel into Kentucky. By the mid-1790s most Native American threats had been neutralized in Kentucky. The sheer number of settlers and their militia organizations made it difficult for even the most defiant Cherokees to continue their raids. During the early nineteenth century, most Cherokees finally accepted the inevitable and acculturated to white ways or remained secluded in remote Appalachian Mountain communities. Whether they accepted white culture or not, most Cherokees were forcibly removed to the west side of the Mississippi River in the 1830s to what is present-day Oklahoma. The tragic route west became forever known as the Trail of Tears. 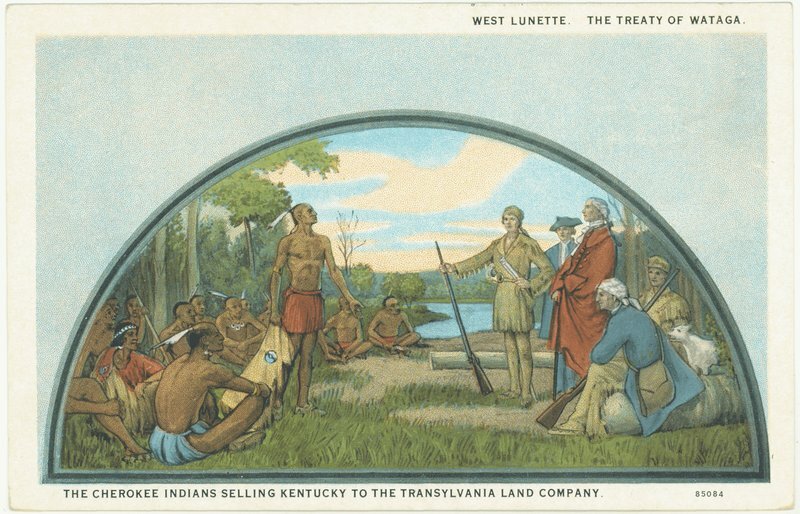 Sycamore Shoals: This postcard shows an artist's interpretation of the meeting between the Cherokees and the Transylvania Company at Sycamore Shoals on the Holston River. Courtesy of the University of Kentucky. 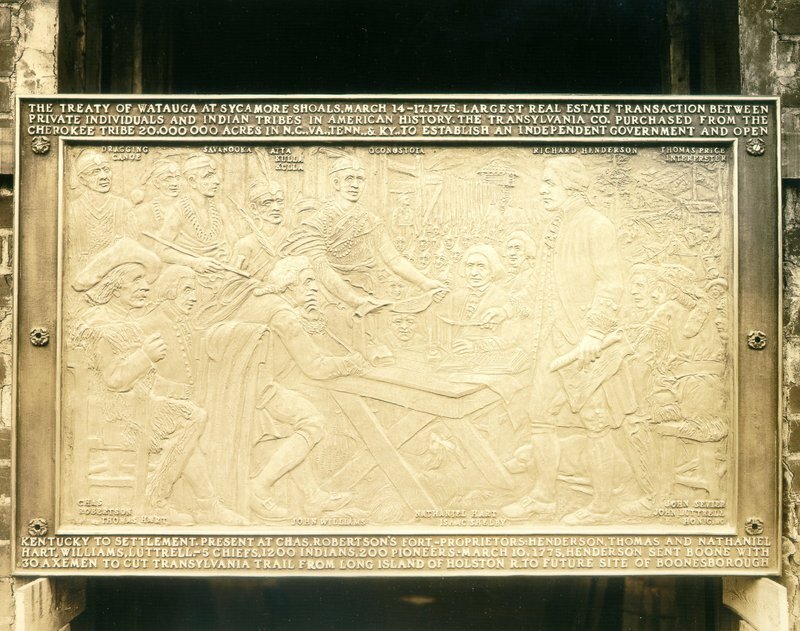 Transylvania Treaty: This engraved plaque depicts the land transfer between the Cherokees and the Transylvania Company at Sycamore Shoals. Courtesy of the University of Kentucky. 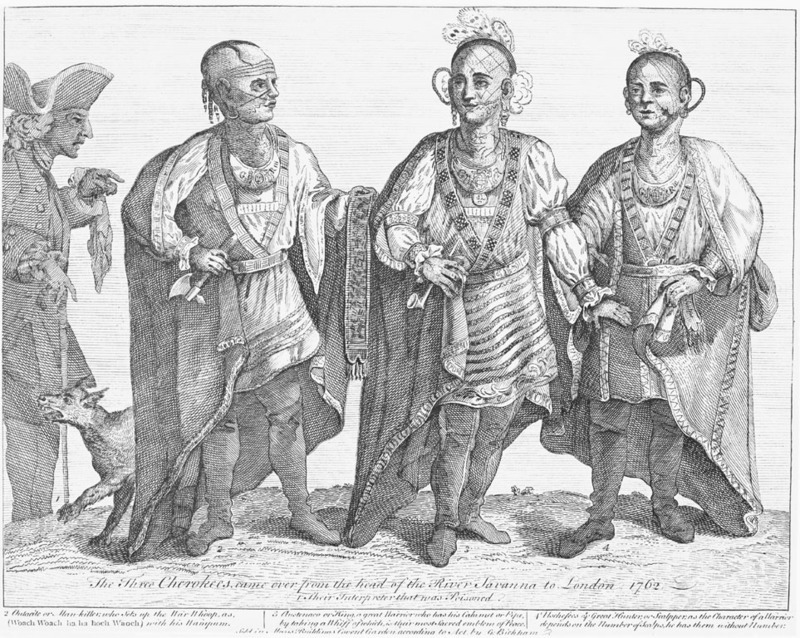 Cherokees: These three Cherokees were taken to London in the 1760s. Image in the public domain. 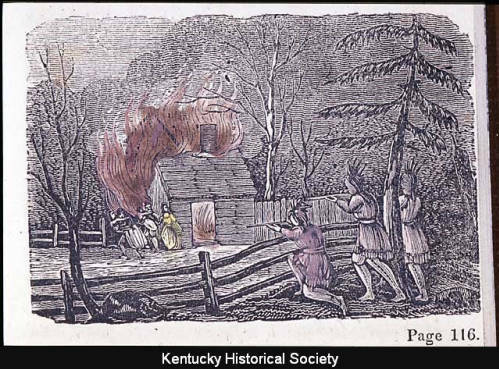 Native American Attack: Terroristic atrocities occurred quite frequently between settlers and Native Americans on the Kentucky frontier. Courtesy of the Kentucky Historical Society. Cabin Raid: This woodcut depicts a pioneer family fleeing their home, which was set on fire by Native Americans. Courtesy of the Kentucky Historical Society. Tim Talbott, “Cherokees in Kentucky,” ExploreKYHistory, accessed April 19, 2019, https://explorekyhistory.ky.gov/items/show/565.